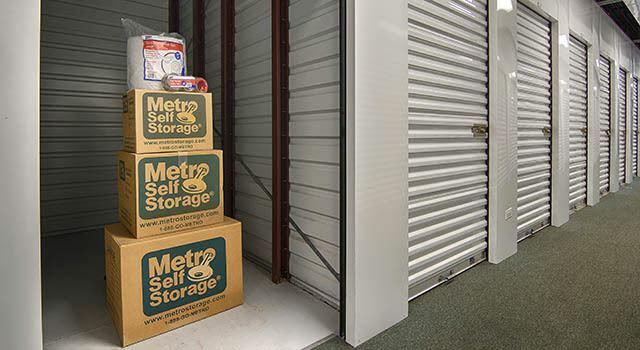 Founded in Illinois, Metro Self Storage in Batavia, Illinois is a full-service storage facility offering 24-hour access, electronic keypad access, security cameras, moving carts, online account management, and a customer care hotline. For households and businesses, there are many reasons to rent a climate-controlled storage unit in Batavia. Winter temperatures frequently drop below freezing and can damage temperature-sensitive household items such as photos, electronics, archival documents, and artwork. Our Batavia storage facility offers climate-controlled units inside a building with sealed and insulated roofs, walls, and floors. A building envelope surrounding your storage unit offers additional protection from heat, humidity, and dust, and even the most determined pests can be avoided. Our climate-controlled building on Kirk Road has eight access doors, including two double-wide doors that allow access for larger items. Call our top-notch team of friendly storage experts with your questions about renting a Batavia climate-controlled storage unit today. Already know what size you want? Reserve your storage unit now with our no risk storage hold and take advantage of our online promotional storage rates.